To use your Droid Bionic phone as a camera, you have to hold the phone away from your face. Before doing this, start the Camera app, which you can find on the App menu or, more conveniently, on the Dock, right next to the Launcher button. 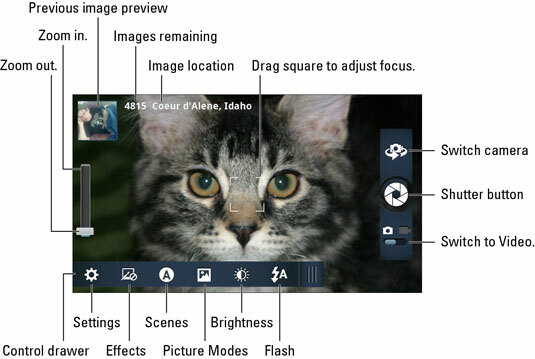 After starting the Camera app, you see the main Camera screen, as illustrated in this figure. The controls shown in the figure eventually disappear, leaving the full screen to preview the image. To take a picture, point the camera at the subject and touch the Shutter button (shown in the figure). After you touch the Shutter button, the camera will focus, you may hear a mechanical shutter sound play, and the flash may go off. You’re ready to take the next picture. To preview the image you just snapped, touch the little icon that appears in the upper-left corner of the screen, as shown in the figure. The camera focuses automatically, though you can drag the focus square around the touchscreen to specifically adjust the focus. You can zoom in or out by using the onscreen controls or by pressing the Volume Up or Volume Down buttons, respectively. Because the zoom is a digital zoom, the image is magnified, as opposed to an optical zoom, which is done by adjusting the camera’s lens. If the onscreen controls disappear, touch the screen again to bring them back. Pressing the Menu soft button displays the Control Drawer. The phone can be used as a camera in either landscape or portrait orientation, though the phone’s controls and gizmos are always presented in landscape format. You can take as many pictures with your Droid Bionic as you like, as long as you don’t run out of storage for them on the phone’s internal storage or MicroSD card. If your pictures appear blurry, ensure that the camera lens on the back of the Droid Bionic isn’t dirty. The Droid Bionic not only takes a picture but also keeps track of where you were located on Planet Earth when you took it. The Droid Bionic stores pictures in the JPEG image file format. Images are stored in the DCIM/Camera folder; they have the jpg filename extension. By default, images are stored on the MicroSD card. You can change the storage location by pulling out the Control Drawer and choosing the Gear icon. Choose the Storage Location and select either Internal Phone Storage or SD Card. Touch the image preview that appears in the upper-left corner of the screen (refer to the figure). After touching the preview, you see the full-screen image. Press the Menu soft button and choose the Delete command. To return to the Camera app, touch the Camera button, found in the upper-left corner of the preview screen.